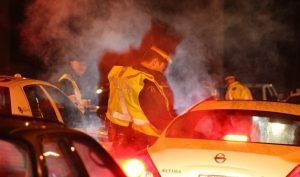 THE annual holiday CounterAttack campaign is kicking off this weekend with roadchecks set up across the province. The B.C. government, police and ICBC are urging drivers to plan ahead and make smart decisions to get home safely this holiday season. Impaired driving remains a leading cause of fatal car crashes, with an average of 68 lives lost every year in B.C. Police across the province will be setting up roadchecks to keep impaired drivers off our roads throughout December. For more than 40 years, ICBC has supported impaired driving education campaigns and funded CounterAttack enhanced police enforcement. ICBC also provides free special event permit kits for businesses, sports facilities and community groups to promote the get home safe message. ICBC is a sponsor of Operation Red Nose, a volunteer service in 19 B.C. communities that provides safe rides to drivers who feel unfit to drive, no matter the reason. This service is available from November 30 until December 31 on Friday and Saturday nights, including New Year’s Eve. Next fiscal year, ICBC will be directing additional funding to police traffic enforcement throughout the province without increasing the operating budget. The funding will come from ICBC’s annual advertising budget. This shift in focus will help get more police officers on the road to crack down on risky driving behaviors and help prevent crashes. Get more stats and facts from ICBC’s infographic and learn more about the CounterAttack campaign on icbc.com. – On average, 17 people are killed in crashes involving impaired driving in the Lower Mainland every year. – On average, 10 people are killed in crashes involving impaired driving on Vancouver Island every year. – On average, 23 people are killed in crashes involving impaired driving in the Southern Interior every year. – On average, 19 people are killed in crashes involving impaired driving in North Central B.C. every year.